It’s not too late to get your personalised ski trip hoodies. Acorn has been supplying ski clubs with tour or group clothing for many years. 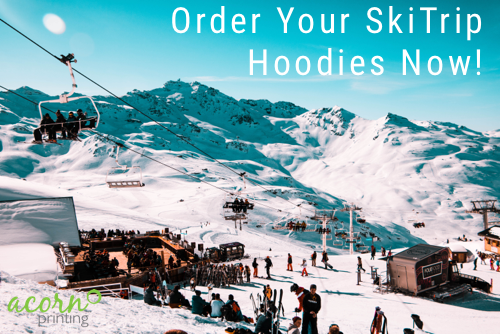 Whether you want something practical to wear for yourself, or you’re organising your entire group’s outwear, we can ensure that you that your ski hoodie will be the perfect memento for the perfect trip. Our range of ready-to-personalise hoodies and sweatshirts offer you a great choice of styles, colours and sizes. Acorn stocks the biggest brands (such as AWD, Cottonridge, Gildan, Tombo and Uneek) and can source specialist gear if you need it. If you want something even warmer we also have a range of soft shell and winterised jackets that are fit for the slopes. We have sophisticated on-site facilities for both printing and embroidery of clothing. That means that we can add your club or society logo, crest and graphics, or the names of tour members, almost anywhere on your garments. It also means that we can cope with any size of order at great prices and top quality. Check out the hoodies and sweatshirts on our website or contact Acorn today on freephone 0800 0190 552 for advice on designs and products.